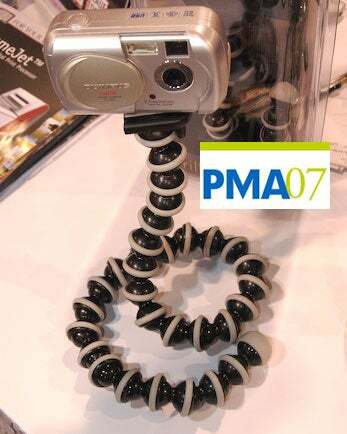 Joby introduced a new member of the GorillaPod family at PMA 2007, the GorillaPod Solo. Instead of a tripod, it's just got one long leg that can wrap securely around much larger objects than the original versions can. It comes in two sizes, 20" and 30". It uses the same quick release head as the GorillaPod SLR, so it can even be adapted to a shoe mount for off-camera flash (Strobists rejoice!). Prices are $29 and $39 respectively.